Preview of the Exhibition is at Artsmill 2pm - 4pm this Sunday 9 September. The exhibition runs from 12 till 30 September. Paper Cut Artist, Pippa Dyrlaga is originally from Mirfield, West Yorkshire and is now based in Hebden Bridge. Pippa has been making paper cut work since around 2009, when she started exploring the medium whilst studying for her masters. She graduated in 2006 with an art degree from Leeds Metropolitan University and then returned to the same university to graduate in 2011 with an MA in Art and Design with a specialism in curating. Pippa has been an active fundraiser following the 2015 floods, raising funds through the sale of prints and has worked with several local businesses, Watermark (producing a fundraising print for Heart Gallery), Heart Gallery (Bee prints for fundraising for Manchester), Element Jewellery (part of the partnership between business owners and artists to create something for the windows of shops whilst they refitted following the floods). Pippa's first solo show is at The David Wright Gallery at Artsmill, in Hebden Bridge. The Exhibition is called, 'Forgotten Moments From Someone Else's Past'. She creates artworks by cutting images from a single sheet of paper, using traditional techniques to create contemporary works. Her work is inspired mainly by the natural world and the things she encounters day to day. My paper cut works are first drawn in pencil on the reverse of the paper and then cut by hand using a fine pointed blade. Cut pieces can take from a day to complete, to over 100 hours." 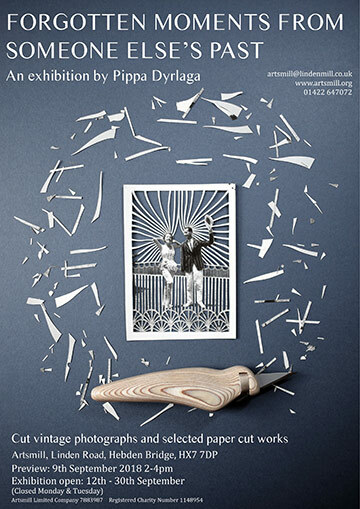 Pippa Dyrlaga's exquisite Paper cuts, Intricate, delicate Cut vintage photographs and intriguing prints exhibition: FORGOTTEN MOMENTS FROM SOMEONE ELSE'S PAST is well worth a visit. Preview On Sunday 9th 2-4pm exhibition runs until September 30th. Closed Monday and Tuesday." "About a year ago I found some old photograph albums in a box in Huddersfield Market. I was drawn to two albums in particular, as it appeared that the lady in them was an artist herself. I bought them from the Market holder and took them home, where over the next year I would take them out and look through them, wondering who she was and how they had ended up disgarded. "After the death of my granddad this year, our family began sharing his and our own old photographs with each other, discussing where he was and who else were in the images he treasured. It made me think again of the photographs in the albums I had bought and the snapshot of this ladies life we had but had been forgotten over time and all I had of the record of this life were these two precious albums, neatly laid out and noted. It inspired me to get the photographs out again and I started to cut into them, creating artworks where the people in the images were the focus, creating a new life and narrative for them. "The small few I had of her and her friends has now grown to a collection of other similar albums and photographs, separated from their family and owners over time, and it is a celebration of these forgotten lives and forgotten moments. " Since going full time as an Artist, Pippa has exhibited internationally, and she has work in private collections all over the world. Her work has appeared in press (Elle Décor, Huffington Post, Martha Stewarts website, Casa Vogue Brasil, Creators Vice), and in print. Pippa stated "I have recently just finished illustrating a French children's book, and exhibited in Portland, and shortly in LA and Chicago. I have also worked with a French wrapping paper brand, York University, Excel blades, Awagami Paper Factory in Japan and some US based brands. Right now, I am just perfectly happy to continue creating and see what opportunities come up. I am working on several series and want to expand the photography series. Who knows what will happen in the future! At some point soon I will also be creating a book of my work."